Barbara’s Note: I buy my meat from these two young farmers–fabulous pork shoulders and chops, chickens and ducks–and am much inspired by their example. Kate Corrigan grew up in Shoreham, Vermont where her family raised their own eggs, pork and poultry. Sebastian Miska grew up in the Middlebury, Vermont area and enjoyed frequent visits to family in Germany, where he developed an appreciation for pork charcuterie. 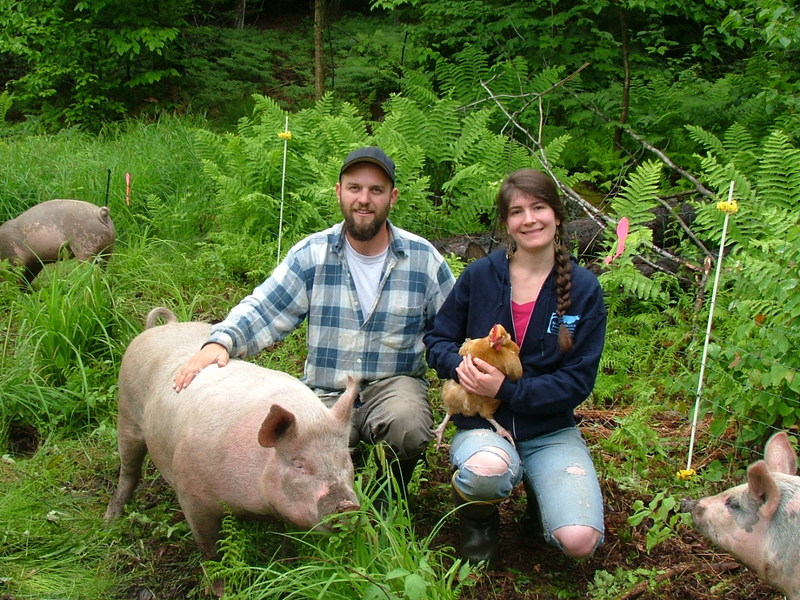 The pair started farming together in Ripton in 2006. More info on North Branch Farm & Gardens at GreenMountainGrown.com. Mad Cow Disease. Million-pound hamburger recalls. Antibiotic-resistant bacteria. A dead zone in the Gulf Coast the size of New Jersey. News stories and movies like Food, Inc. and Fast Food Nation are making more people aware of problems with our current food system. As awareness grows, so does the demand for food produced in a different way. We see it firsthand from our booth at Farmers’ Market, where more and more people pick up our brochure, looking for locally grown meat. 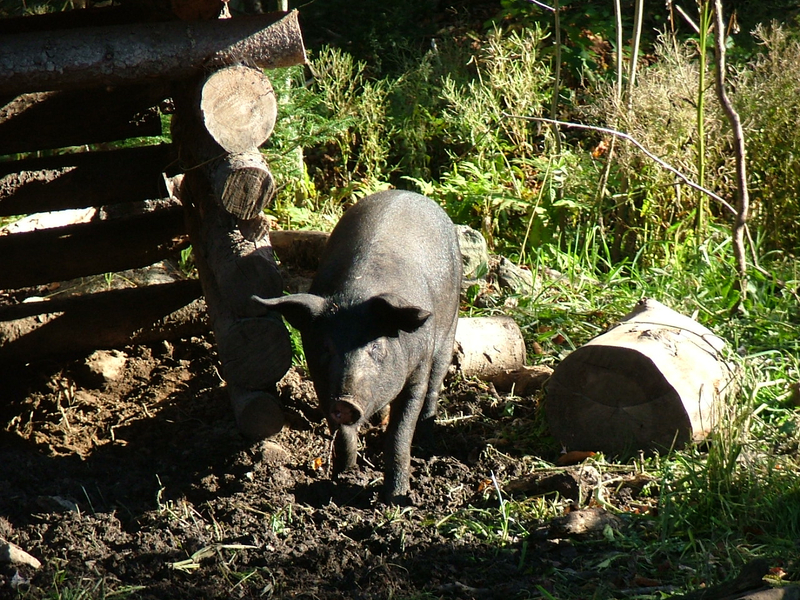 On our Ripton farm, North Branch Farm & Gardens, we raise pigs, chickens and ducks outside, with room to roam and forage. We feed them organically grown grains. Of course this extra work and care makes our meat more expensive. We’ve had folks who won’t consider our products due to the price. But we also have customers who comment on how low our prices are! With market prices for pork chops ranging between $2/lb to $12/lb and chicken from $2/lb – $6/lb, one thing is for sure– shopping for meats is far from straightforward. So here it is: Buying Local Meats 101. Lots of people buy locally grown veggies – that’s child’s play for the savvy localvore. But when the search turns to meats and eggs, a maze of buzzwords awaits. Pasture-raised! Grass Fed! Antibiotic free! Vegetarian fed, Cage Free, Free Range, Heritage Breed, Organic… What do they all mean, and why? Apparently all locally grown meat is not created equal. One thing to keep in mind is that these terms don’t always mean what they might suggest. For example, the “official” definition of free-range is chickens not in cages, but they do not necessarily live outside (although some farmers do use the phrase this way). 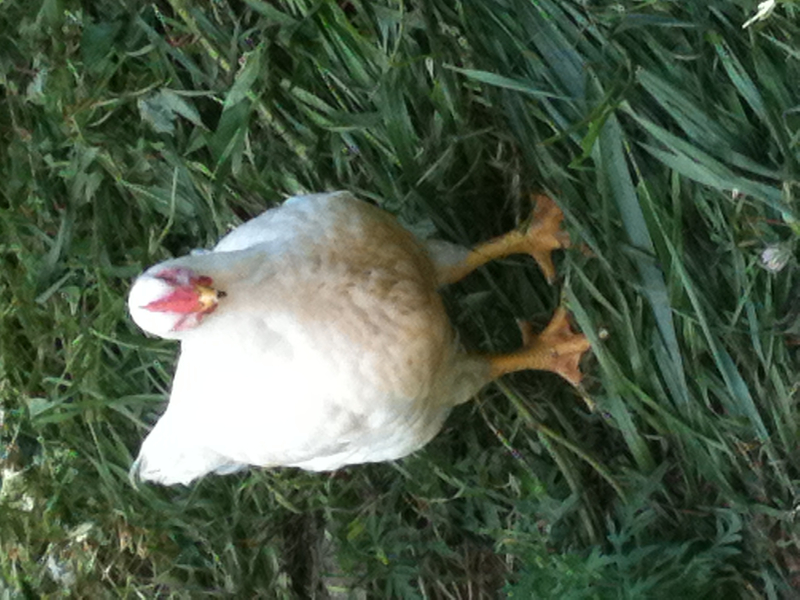 You will want to look for the word “pastured” for eggs from hens outside on a pasture. Our laying hens’ travels take them through pasture for some of the day, but they also like the woods and bushes a lot. We call them our clean-up crew because they do a nice job keeping the weeds down in my garlic and flower beds (veggies are safely fenced), and they clean up after our pigs. A tough lifestyle to sum up with a quick catch phrase. So, the best way to buy local meat is to find a local farmer whose farm practices are in line with what you want, then order ahead and buy direct. Or go to Farmers’ Market, or ask at your favorite grocery stores. Any way you slice it, you will want to do some research on the farms raising the animals. What are their practices? What do they feed the animals? Why have the farmers chosen these practices? With so many ins and outs to raising livestock, consumers may need to educate themselves quite a bit before they understand a farmer’s decisions. Whether a farmer uses antibiotics, for example- is it regular use of antibiotics to increase growth and fight a myriad of possible health problems due to unnatural living conditions? Or is the use only when absolutely necessary, despite a healthy environment being provided? Organic certification requires that a treated animal can no longer be sold as organic, which is why you will rarely see organic lamb. Since lambs can die from certain parasites, it is occasionally necessary to treat them. Considerable misunderstandings occur when it comes to grass-fed and pasture-raised. These terms are not regulated like the word “organic.” I’d like to be able to clarify, but my definitions went out the window when fact-checking this article, serving as a reminder that each farmer has his/her own definitions. You will usually see grass-fed used for beef or lamb, which can be raised solely on grasses and forbs (also known as weeds), or hay, with good results. Sometimes you will see “grass-finished,” to indicate that the beef was not finished on corn as is usually done. The most important thing to note is that with very few exceptions poultry and pork require grain in addition to pasture. I know of only one farmer raising pigs without grain, and no one raising meat chickens without grain. And here is where organic really comes into play. Grain (usually corn, wheat, soy, peas, etc.) can be grown “organically” or “conventionally.” Since the USDA made it law, Organic means that the crops were grown without the use of GMOs (genetically modified organisms) or synthetic pesticides or fertilizers. Many consumers, if asked, would opt to avoid these things, which are often not on people’s radar when it comes to local meats. Many people wrongly assume that local animal products are GMO free. Because no labeling is required, even the farmer may be unaware that he is feeding genetically modified feed. Because the use of GMOs is so widespread, however, (approx 70% of US corn, 90% of US soy) it can only be avoided with organic feeds, or by growing feed from non-GMO seed. So good luck with your shopping. With reports from the UN and more recently from Environmental Working Group on the effects of livestock production and meat consumption, we are bombarded with advice to cut way back or give up meat altogether. I would like to remind all the meat eaters out there that it doesn’t have to be this way. There is a middle ground. Animals can be an integral part of a working landscape. Here in Vermont we are lucky to have options. Eat meat in moderation of course; and remember that, as with most things, it is the “how,” not the “what,” that matters. Schnitzel is delicious with a little gravy and mushrooms, or with a sauce and capers, and any leftovers are great on a sandwich! Season flour with salt and pepper and put on a plate. Beat the egg in another wide dish. Breadcrumbs go on a third plate, seasoned to taste. Chopped garlic or herbs or spices can be added to the crumbs if desired. Press each piece of flattened meat into the flour, flipping to coat on both sides, then dip into the egg mixture, and then into the bread crumbs so that they are thoroughly coated. Use a large skillet on med-high heat with a good quantity of high-heat oil or lard to fry up the schnitzel. When one side is browned, flip and brown the other side. The thinner they are, the faster they will cook. We offered samples of this simple dish at Farmers’ Market recently where it was enjoyed by all who tasted it. The strips can be cut up and used in Asian-style noodle dishes, stir fries, or spring rolls. In the summer, rice paper spring roll wrappers make a quick easy meal with some bits of meat and veggies and cilantro, basil, or mint rolled up, with a dipping sauce on the side (soy or tamari, with a little vinegar is a quick easy sauce). The pork strips can also be used to make your own banh mi (the popular Vietnamese sandwich). Just take slices of bread or a roll, with mayonnaise and/or mustard, a pork strip or two, sliced cucumber, and some kimchi. Feel free to experiment with other toppings! Your favorite Asian marinade – or mix up your own using ingredients such as sesame oil, tamari, hoisin or soy sauce, a little vinegar, honey, five spice, ginger, chili garlic paste, or whatever Asian-style ingredients you have on hand. Mix pork thoroughly with the sauce and allow to marinate in the fridge overnight. A shorter or longer time is fine too. Several days won’t hurt and you will have a quick meal on hand! Cook the strips in a frying pan as you would bacon, flipping when one side is done. They should take about 5 minutes, maybe less!